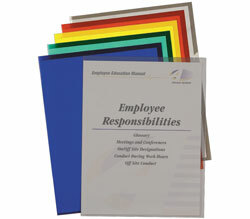 This spiral-bound organization product stores notes and documents in a protective holder. Suitable for both students and professionals, the sleek outer cover provides a stylish appearance to the portfolio. Organize projects, subjects, notes and more in one convenient place. Ten interior pockets allow for detailed organization. Write-on tabs make for quick and easy custom organization; works with pencil, ball point pen or permanent marker. Spiral-bound portfolio features clear-view front pocket for cover sheet. Made of heavyweight acid-free polypropylene. For letter size documents. Clear cover and pockets with assorted color tabs.